The online version of this article ( https://doi.org/10.1186/s12951-019-0477-z) contains supplementary material, which is available to authorized users. Surgical reconstruction of ear cartilage is required after trauma, infection, burns and congenital diseases [1, 2, 3, 4, 5]. Microtia, translated from the Greek, means little ear and is the medical word to describe a small or absent ear in newborn babies. The surgical reconstruction of the ear was first described by Tanzer et al. who used a six-stage procedure . Since then Brent and Nagata modified the technique to a two-stage procedure, which has now become the most commonly used method of autologous ear reconstruction [7, 8]. In this procedure, cartilage is harvested from the ribs and carved into an auricular shape to place beneath the subcutaneous tissue. At approximately 6-months post the first procedure, the patient undergoes a second procedure to elevate the framework from the side of the head by placing further rib cartilage under the original carved structure. The main advantage of this technique is that rib cartilage is from the patient and thus is biocompatible but can be limited due to the amount of available rib cartilage. Despite being the gold standard technique, there are drawbacks to this autologous technique. Harvesting of rib cartilage has many surgical risks including pneumothorax, atelectasis, chest-wall deformities and it may cause scar and post-operative pain [3, 9]. With time the cartilage can also resorb and warp in shape, creating unreliable end results. Furthermore, the good clinical outcomes originally described by Brent and Tanzer are not always achieved due to the technical challenges of performing the surgery . Due to autologous rib cartilage providing potential donor site morbidity and the technical challenge of the surgery, synthetic materials can also be used to reconstruct the ear cartilage . Several prefabricated ‘off the shelf’ framework materials have been developed for ear reconstruction. The most commonly used material is Medpor, a high-density polyethylene (HDPE, Medpor, Pores Surgical Inc.). Medpor was developed in the 1970s and first reported for use in 1983 for reconstructive purposes [12, 13, 14]. However, reports of infection and extrusion with Medpor have prevented its widespread use . This has prompted the need to develop alternative materials to improve the outcomes of synthetic auricular reconstruction. Plasma surface modification (PSM) is one established technique, which creates a hydrophilic surface and can improve cell adhesion. PSM modifies the surface topography and immobilises chemical functional groups onto the surface [24, 25, 26]. Plasma is defined as a gas in the ionised state and was introduced by Langmuir in 1928 . Applying a potential through a gas generates plasma modification. Radiofrequency plasma is the most widely used biomaterial surface treatment and involves passing an electric current through a gas at low or high pressure. Several studies have shown the beneficial effects of PSM on cell adhesion, proliferation and differentiation due to the surface topographical and chemical immobilization it creates [16, 25, 26, 27, 28]. Hence, this study modified nanocomposite polyurethane implants with PSM to make it a suitable replacement for auricular reconstruction. 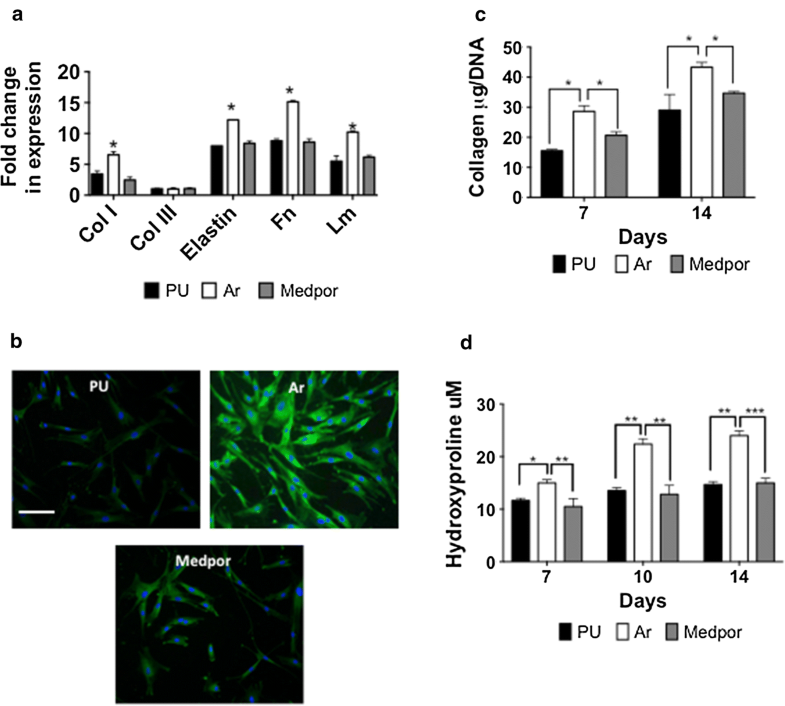 We have shown previously that argon PSM is a superior surface modification technique compared to nitrogen and oxygen plasma treatment in improving cell adhesion, extracellular growth formation and tissue integration and vascularisation in vivo . The surface’s physiochemical properties of the argon modified polyurethanes scaffold’s has been fully characterised demonstrating a hydrophilic and etched surface compared to unmodified polyurethane scaffolds . In this paper, all in vitro and in vivo experiments were conducted on the three scaffolds; unmodified polyurethane (PU), argon modified polyurethane (Ar), and Medpor (0.85 mm thickness sheet, Porex Surgical, Newnan, GA, USA). PU scaffolds were synthesised and fabricated as described previously [16, 28, 29, 30]. In brief, polycarbonate polyol (2000 Mwt) and transcyclohexanechloroydrinisobutyl-silses-106 quioxane (Hybrid plastics Inc.) was mixed with POSS cages. To form the pre-polymer 4,4-methylenebis (phenyl 109 isocyanate) MDI was added to the solution. Then ethylenediamine and diethylamine was added slowly in DMAC to the mixture. The scaffolds were then fabricated using a previously described porogen leaching/solvent casting technique [16, 28, 29, 30]. In summary, the POSS-modified polycarbonate urea-urethane polymer solution was mixed with sodium chloride porogen (NaCl with pore size 150–250 μm) in a ratio of 1.1. The slurry was then mixed and degassed in a Thinky AER 250 mixer (Intertronics, Kidlington, UK). The mixture was then coated onto titanium moulds and heated for 4 h at 65 °C degrees. Following immersion in deionised water to dissolve the NaCl and DMAC for 24 h, the procedure was repeated until the final thickness of 0.85 mm was reached. Following the final layer, the scaffolds were further washed in deionised water for a further 7 days to ensure all the NaCl and DMAC was removed. Subsequently the PU scaffolds were modified with argon modification and referred to as Ar scaffolds. Unmodified PU scaffolds and referred to as PU. Argon modification of PU scaffolds was performed by exposing the scaffolds to 5 min using a radiofrequency plasma generator operating at 40 kHz with gas flow of 0.4 mbar at 100 W. Subsequently, for in vitro and in vivo experiments, 16 mm disks were cut from the polymer sheets. 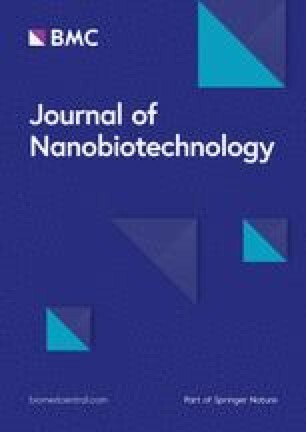 Reports have demonstrated that protein adsorption is greater on hydrophobic surfaces [34, 35, 36]. However, there are also reports that have shown that protein adsorption can be varied on hydrophilic surfaces and protein adsorption can occur on hydrophilic surfaces . Protein adsorption depends on the difference in the charge interaction and protein conformation of the scaffolds . The function of a protein is determined by the protein conformation and the activity of the protein is controlled by the orientation and or its conformation . The greater cell adhesion and growth observation observed on Ar scaffolds than Medpor could be due to both increased protein adsorption and more proteins were adsorbed in optimal conformations despite Ar scaffolds having a hydrophilic surface. With optimal proteins adsorption, more cells were able to adhere to the Ar scaffold to form tissue and allow for vascularisation in vivo. Surface roughness is also important in determining protein adsorption to a scaffold surface . Medpor was shown to have a rougher surface than Ar. Studies have shown that increasing the roughness of a surface may increase the surface area for potential proteins adsorption . However, the rougher surface may have also prevented the proteins to be adsorbed in an optimal conformation and created inactive reactive sites. The smoother surface of Ar compared to Medpor may have provided an optimal surface topography for protein adsorption in the correct configuration to induce the desired cell responses. The greater protein adsorption on Ar scaffolds would have allowed for greater cell adhesion, which would have contributed to greater tissue formation and vascularisation in vivo. It is important to highlight that protein adsorption is a complex process and does not only depend on vitronectin and fibronectin adsorption, which were the proteins evaluated in this study. 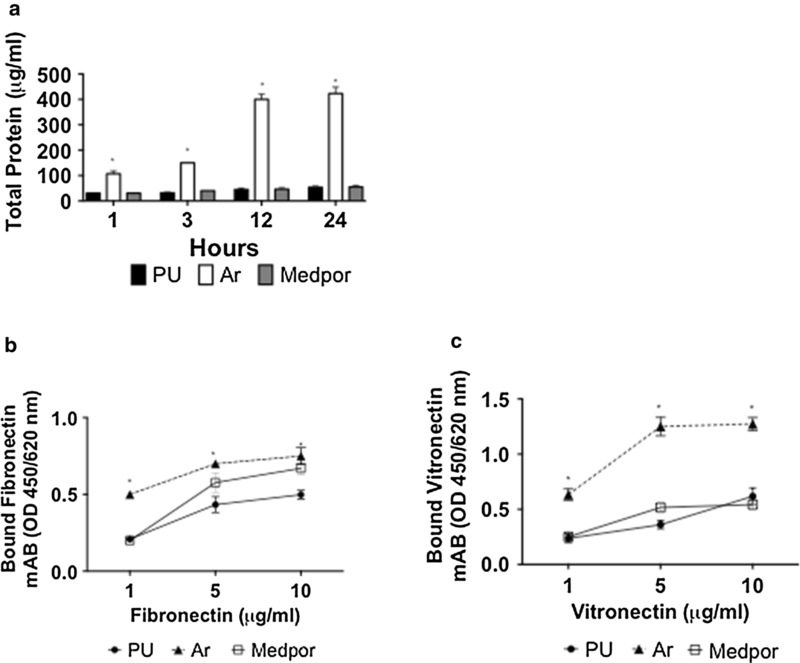 After implantation in vivo, several protein adsorb onto the implant surface including plasma proteins, albumin, fibrinogen and many more [39, 40, 41]. Hence, future studies must examine the behaviour of several other proteins in human plasma not only vitronectin and fibronectin to completely comprehend the protein-surface interaction that is occurring on the Ar scaffolds. All biomaterials undergo a foreign body response to the host tissue when implanted subcutaneously . It is a structured sequence of events to allow for the host tissue to accept the implant. To determine if the observed differences in the secretion of cytokines and behaviour of the macrophages caused any difference to the foreign body response the immune response to the scaffolds was examined in vivo. The CD68 macrophages were examined in vivo over 12 week on all three scaffolds. There was a similar decrease in the macrophage response over the 12 weeks. Typically all implants trigger the attachment and recruitment of inflammatory cells as apart of the foreign body response reaction when a biomaterial is implanted . Macrophages not only govern the inflammatory response by secreting chemokine, cytokines and growth factors but are also important in tissue regeneration . Despite observing differences in the in vitro macrophage responses, no differences were observed in the in vivo recruitment of macrophages to alter the immune response of the three scaffolds. Future work, will examine the proportion of activated and polarised macrophages and their M1 or M2 phenotype to understand the significance of the in vitro findings and to understand their role in modification of inflammation and regeneration. The M1 phenotype is involved in the killing of pathogens as a pro-inflammatory response [49, 50, 51] where as the M2 macrophages suppress the intracellular killing processes and reduction of pro-inflammatory responses by producing IL-10 . The ELISA analysis may indicate there is greater amount of M2 macrophages on the Ar scaffolds due to the higher levels of IL-10 secretion. Additional file 1: Figure S1. 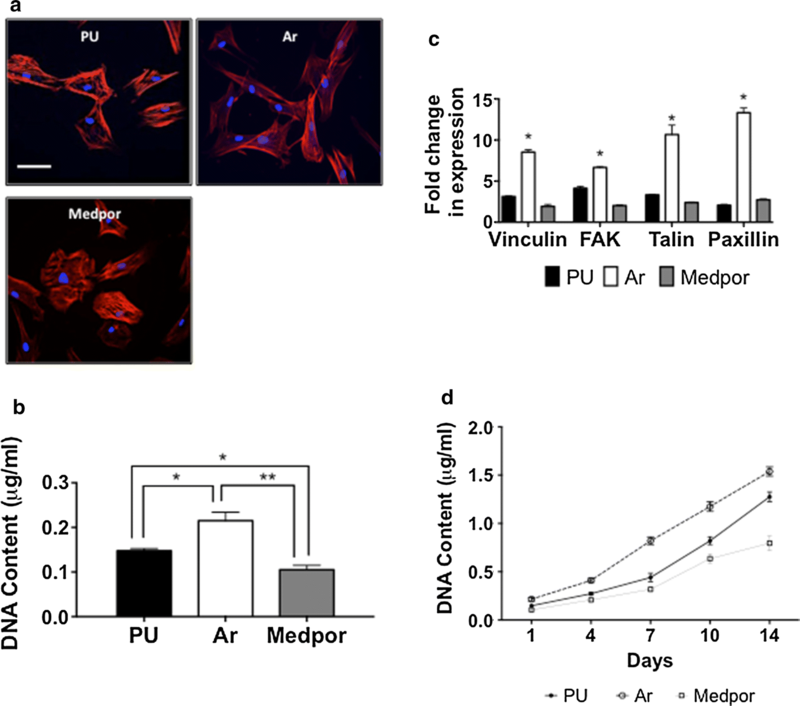 Human macrophage morphology on polyurethane (PU), argon (Ar) and Medpor scaffolds after 24 h. F-actin staining demonstrates more elongated cells (red arrow) on the Medpor and Ar scaffolds than the PU scaffold. Some macrophages showed evidence of pseudopodia (yellow arrow). Scale bar refers to 50 μm. PU; Unmodified Polyurethane. Additional file 2: Figure S2. Cytokine profile secreted from the macrophages after 10 days in vitro on polyurethane (PU), argon (Ar) and Medpor scaffolds. [A] Tumor necrosis factor-α (TNF-α) secretion was significantly greater on Medpor than PU and Ar scaffolds at 4, 7 and 10 days (*p < 0.05). 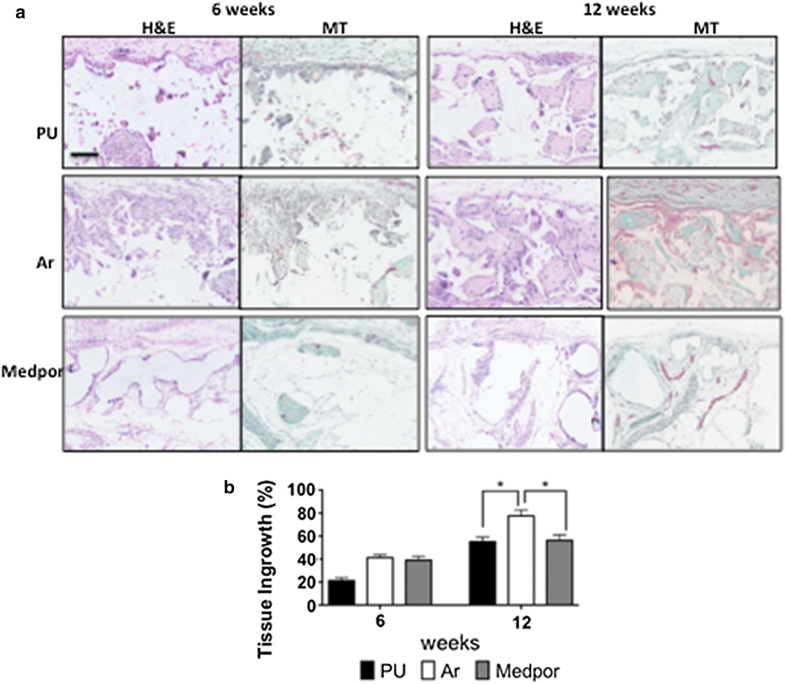 [B] Interleukin-1β (IL-β) secretion was significantly greater on Medpor than PU and Ar scaffolds at 2, 7 and 10 days (*p < 0.05). [C] Interleukin-10 (IL-10) secretion was significantly greater on Ar than PU and Medpor scaffolds at 4, 7 and 10 days (*p < 0.05). PU; Unmodified Polyurethane.